..and the best news is that 91.25% of them are 3D printed. 13th of July 2018 marks the end of two-year long £4.5mln art restoration project of the 18th century Chinese Pagoda in Royal Botanical Gardens, Kew, undertaken by Historical Royal Palaces, an independent charity looking after various historical sites across the UK. This project is special for a number of reasons. First of all, it has been a multidisciplinary endevour that established new boundaries and crossed many levels of existing bias about 3D printing/ additive technologies not being en par with traditiona craftsmanship. Secondly, it opened a discussion about new experimental materials and ways in which these materials can be used in unison with existing manufacturing techniques in order to counteract the damage and decay caused by aging of the materials. Last but not least, the project was revolutionary thanks to its new approach of not just preserving the status quo with minimum impact, but to actively restore the landmark to the level of detail intended in original design by Sir William Chambers. The Great Pagoda was constructed in 1672 during the rule of King George III, a monarch remembered by history for episodes of occasional 'madness' and loss of the US colonies. The king often sought recluse in Kew Palace and surrounding greenery during his record-breaking 60-year long reign. The Pagoda epitomised the craze for Chinoiserie and craving for exotica powered by the overseas exploration and lifestyle aspirations of the burgeoning middle classes benefitting from stable economy and industrial developments. Standing 163ft (49.6m) tall, with 10 tiers stacked vertically on the octagonal plan, the pagoda was the tallest and undoubtedly the quirkiest of buildings in the vicinity of London whose architecture had largely been consumed by The Great Fire only 6 years prior. Back in the day, pagoda's construction raised quite a few eyebrows followed by doubts regarding its structural soundness and integral stability - it was an unprecedentedly tall building defying the laws of nature. The original design of the Pagoda featured 80 gilded dragons in auspicious colours, evenly spaced on each of the vertices of the octagonal roofs. However, for the reason unknown until present day, the original statues were removed from the building 20 years after its erection. Urban legends have it that the gilded statues could have been financially liquified in order to cover debts generated by King's son, Prince Regent's lavish lifestyle. Art historians on the other hand seem partial to the theory that solid wooden ornaments had to be removed due to wood damp and progressing decay due to wet weather conditions, which begun to threaten the structural integrity of pagoda's delicate frame. The downdraught effect plaguing modern day skyscrapers might also have been at play, as wide open areas surrounding the pagoda invite strong gusts of wind. The final weight of the adornments was one of the most important considerations for the art preservation specialists appointed by Historic Royal Palaces (HRC). The restoration project called for meticulous research on the subject of Georgian-contemporary materials, pigments and traditional woodcrafting techniques, for no original statues or their replicas remain. The scholars had to work through a great amount of source materials, letters and hand drawings in attempt to recreate the most plausible version of the dragon statue. After careful consideration it had been decided that the 8 dragons on the lowest (and strongest) tier of the building would be created using traditional woodworking techniques, while the statues on the remaining 9 levels would benefit from the use of new manufacturing technology capable of creating significantly lighter parts. 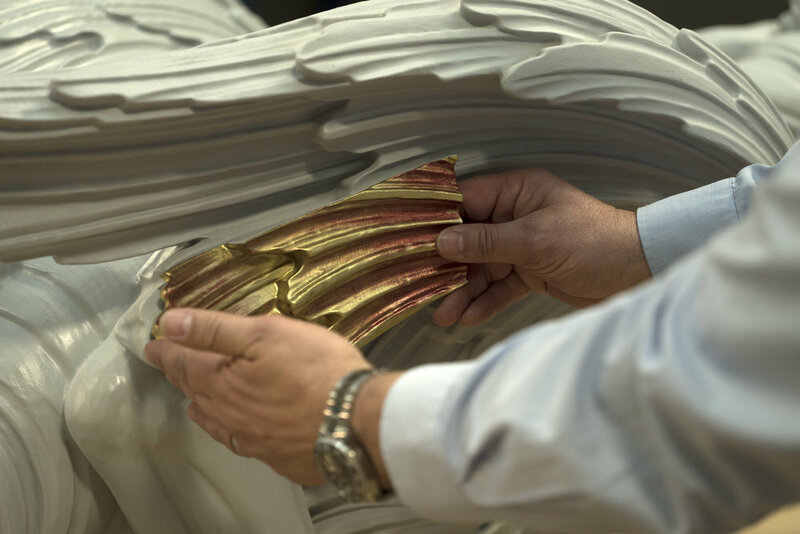 The pieces were to be later decorated to the highest standard by using traditional model making and gilding techniques, making them indistinguishable from their wooden counterparts. 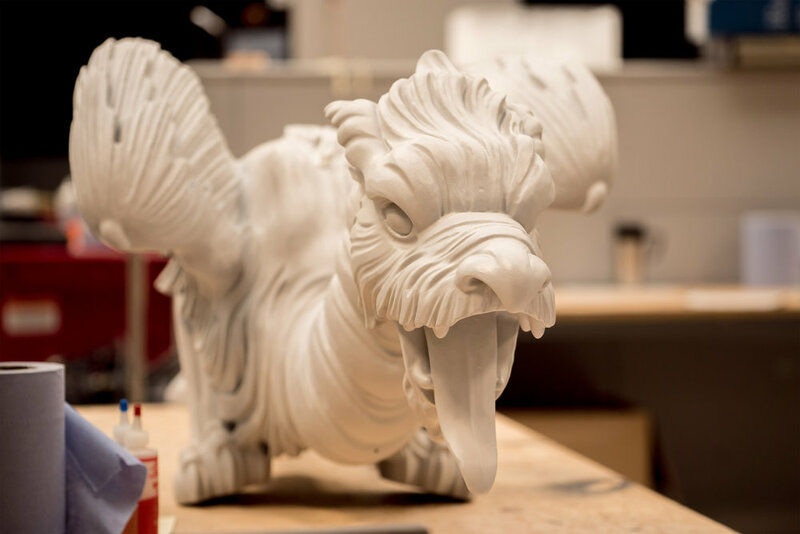 72 (9 sets of 8) of such iterations in various sizes were to be created from a single 3D model created with 3D scanning data obtained by scanning the master model of a hand-carved dragon sculpture created by master carpenters involved in the project. Historic Royal Palaces approached the UK division of 3D Systems directly, based on a positive experience gathered during a number of successful smaller projects in the past. 3D Systems' collective experience in the field of additive paired with agile manufacturing via QuickParts print-on-demand network and part finishing services proved to become the winning formula. HRP appreciated 3D Systems printing expertise as well as holistic approach and personal engagement. 'The client was looking for a cost effective, quick [and] lightweight solution, which would give them dragons which were light enough to fit on the building and could be delivered within the time frame and to the budget. 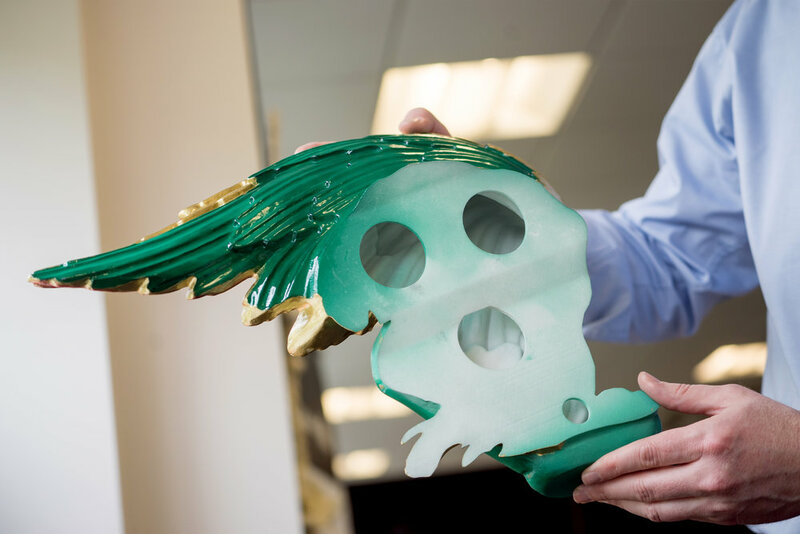 3D printing the dragons in SLS was the way to do it, and we have won the contract' said Nick Lewis, General Manager On-Demand Manufacturing Quickparts UK. Nick's insight highlights the unprecedented impact this project can have on any future projects on comparable and larger scales. With hundreds of artifacts in dire need of conservation could directly benefit from the possibilities that additive manufacturing opens in this particular market. Additive already holds certain advantages in terms of optimised production time frames and low labour cost per part. With enough publicity and trust-building exposure, Additive is on a good way of becoming a certified, viable standard method for Art restoration in the nearby future. With the amount of conservation projects postponed yearly due to high labour and material costs, this is certainly a field worth keeping an eye on. 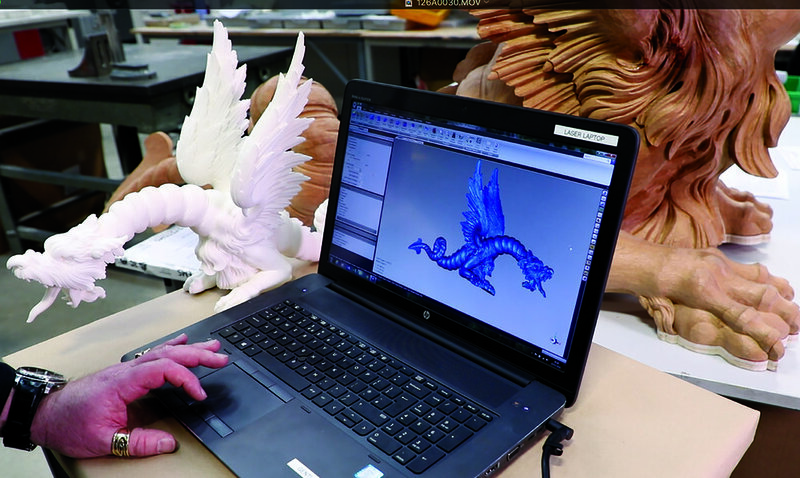 The hand-carved timber dragon statue had been 3D scanned using the FARO® Design ScanArm 2.0 blue laser scanner. (I have been assured that 3D Sense, in my personal experience one of the most disappointing products in the consumer 3D scanner category, had not been used at any stage). The point cloud data had been stitched, meshed and surfaced using the combination of Geomagic Wrap and Geomagic Design X reverse engineering software. 72 dragons up to 1.8 metres long (scales vary depending on the level of the pagoda), have then been printed in parts in DuraForm PA self-supporting Nylon PA12 plastic on the sPro230 SLS system (effective build volume of 750 x 500 x 500; in comparison the largest EOSint P800 system offers volume of 700 x 380 x 560 mm, or 27.6 x 15 x 22.05 in). The 3D model of dragon had been hollowed out to the 1 cm shell and split in parts connected by cleverly concealed sleeve joints and hidden compartments allowing for easy access to the necessary fastening screws. Ready parts were gross de-powdered, blasted with bead glass medium and primed before undergoing a series of custom spray and hand painting steps, finishing with 23.5k gold leaf and epoxy lacquer. In the meantime, the non-3D printed statues had undergone similar painting and gilding process. Throughout the scanning and finishing process, a great deal of attention had been taken to preserve any distinctive markings suggesting original handiwork. 'This needed to be looking like it's been brushed on by an artisan 250 years ago, not sprayed on by a guy 10 minutes ago,' said Simon Hammond, Regional Sales Manager of 3D Systems On Demand Manufacturing, another person involved in the project. 3D Systems' knew that if done correctly, additively manufactured parts would be far more resistant to decay and wether wear than any other material fashioned in a traditional way, potentially lasting 'indefinitely'. Well prepared and sealed nylon polyamide parts parts are expected to outlast their wooden counterparts for tens, if not hundreds of years with minimal or no maintenance. UV-resistant epoxy lacquer further prevents colour fading and ensures the sculptures would battle the elements with grace. The earliest maintenance check up is scheduled in 10 years' time. Some of my faithful readers might be pleased to know that filming drones might be used for this purpose. By using as lightweight a polyamide as nylon PA12 and hollowing the parts to thinnest reasonable thickness, 3DS managed to achieve the decrease in weight to a level of 7-15kg per dragon, depending on the size. The smallest dragons are 1150mm (46in) and the largest - 1850mm (73in) in length. The total added weight to the building closed at around 780kg mark. The results are particularly impressive when compared to 60% heavier wood that would have added 2.5 tonne to the building should the statues be carved in wood. Apart from the reduced weight, they were also cheaper and faster to manufacture, as the process is far less labour intensive. Reverse engineering, SLS printing and part finishing, took approximately ___ from start finish. 3D Systems' representatives pursed their lips about the final cost of the project on their part, only admitting that 3D printing, materials, model making and labour involved 'closed within 6 digits'. Although every press release material of the project state that there are 72 laser sintered dragons on the roofs of The Great Pagoda, there are in fact 73 of them. 73rd 3D printed dragon is Fargesia, an eye-catching and a little ferocious-looking blue dragon designed by 11-year old Florence Oeters, the winner of BBC Blue Peter Design a Dragon competition organised in 2017 as part of the promotion of the dragons' return to the Pagoda. The 2D drawing of the Blue Healing Dragon was translated into 3D environment by modelers of Gentle Giant Ltd, as of 2014 3D Systems' subsidiary specialising in 3D modeling, 3D scanning. Fargesia in 2D. Image courtesy of BBC. Burbank, California-based Gentle Giant's main area of expertise is creating licensed miniatures and action figures from popular franchises, as well as providing 3D scanning services and on-set data capture for CGI/special effects post-processing. The studio is well-versed in translating creative concepts into 3D models, and created this stunning little dragon lady, which was later laser-sintered and hand-painted here in the UK. Significantly larger vertical surface of the part and low weight meant that statue needed to be additionally anchored to the 1st tier roof with the use of three steel lines. I wasn't able to establish whether Fargesia is going to remain a permanent part of the installation (as the Blue Peter competition seemed to suggest to be the case). If she is, however, a better fastening method might be due, as current arrangement distracts the eye and doesn't give the statue full credit it deserves. As usual, the key to success in every project involving Additive Manufacturing is highlighting the synergy between the additive process and complimentary traditional manufacturing techniques. Only by treating 3D printing as equal we would be able to appreciate the true advancement and possibilities it opens. More case studies of art renovation projects like the Pagoda's will demonstrate diverse benefits of Additive Manufacturing in practical context and showcase how the technologies can intersect and compliment each other. 3Dprintinglady.com / Inverted Normals Blog are going to continue to showcase synergy between technologies in various application whenever possible. The restoration project wouldn't come to fruition had it not been for the generous support of the Sanpower Group of Companies, a generous corporate sponsor of the project. With special thanks to Technical Associates Group for organising the event.